Papa's Cupcakeria To Go! App Data & Review - Games - Apps Rankings! 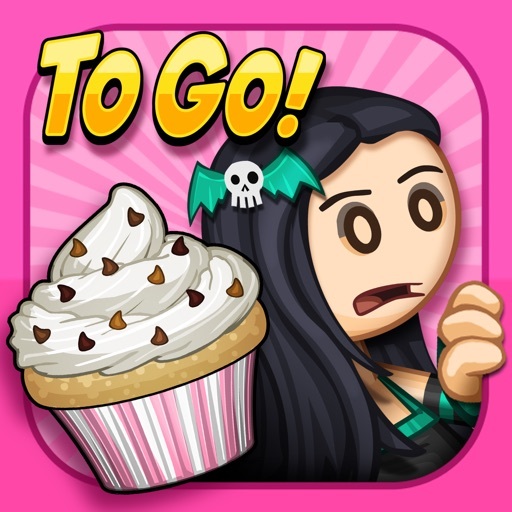 Bake and decorate delicious cupcakes on the go with this brand-new version of Papa's Cupcakeria, with gameplay and controls reimagined for iPhone and iPod Touch! NOW WITH HOLIDAYS - Holidays are finally available in a "To Go" version! As you reach new ranks, the seasons and holidays within the game will automatically change, unlocking new holiday-themed ingredients for the shop! We've also included a number of holidays that weren't available in the original version! ADDING TOPPINGS - The Topping Bin carousel from previous "To Go" games is back, making it easy to browse through your available toppings! 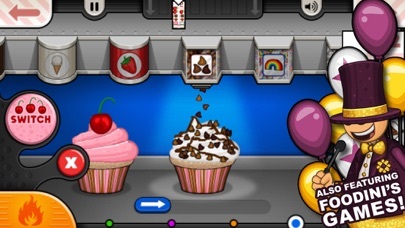 You'll swipe the carousel of Topping Bins to choose the item you want to use, then grab the cupcake to start pouring toppings evenly across the cupcake. Tap a button to switch to festive toppers for your cupcakes, and tap a convenient slider to swap between the two cupcakes in the order! 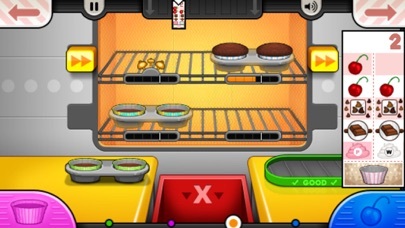 Papa's Cupcakeria To Go is designed especially for smaller screens. The applications Papa's Cupcakeria To Go! 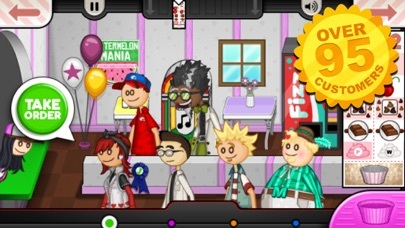 was published in the category Games on 2015-09-14 and was developed by Flipline Studios. The file size is 84.15 MB. The current version is 1.1.0 and works well on 8.0 and high ios versions. Do you like Papa's Cupcakeria To Go! applications? Please share! I payed for this and I hate it. 1: the screen does not fit on my iPhone 8 and it looks blurry on it 2: you can't create your own character like you can on the iPad version 3: I CANT GET MY MONEY BACK!!! The app can be very entertaining during car trips or when you need to relax, but I would suggest a few changes. The characters aren’t leading in religiously diverse characters, like other apps are starting to develop. The color scheme is very saturated, it is a bit hard for the eyes. I would add more then 6 customers in a day as you advance. Also, I would add things that you need to repair in the game, just other things that make the game more interesting. Overall, good idea though it needs some work. when i opened the app for the first time the picture was super blurry and not at all pretty. i've read some reviews and seen that some other people have had this problem. how do i fix this? or does the game just need an update really bad? This is a HORRIBLE game. It’s only $1.99 but it isn’t even worth that. The controls are different from the coolmathgames version, not difficult in a fun way. I can also confirm that it is blurry and doesn’t fill the screen. Super disappointed. The iPhone/iPad version of this game is just horrible. If a game like this wants to charge money I’d quickly advise that the makers would Chang the game so it would be worth the money we pay for it. This app is a rip off. Love it!! The only reason it isn't 5 stars is because the music does NOT stay turned off. Every time I reopen the app I get full volume music, which obviously I don't want because I turned it off. Please fix this in the next update. Awesome app. I started playing it on the computer and got so addicted to it that I just had to get it . I would definitely say it's worth the money and i play all the time . This relates to all of the papa's games. I love the game but can there be more characters to unlock? 1.) Also Jojo after locking red velvet batter he keeps ordering it. 2.) I wish it was possible to customize your own character like in the computer games. This game is really good. I like the mini games. And I am glad that there is a lot of stuff in the shop. In another game that Flipline created called Papas Freezeria there was only one category of things in the shop. In this there is 3 or 4 categories of stuff in the shop. But please update more often. I want more customers and more closers. Thanks! WE NEED PAPA WINGERIA AND ALL THE OTHER ONES YOU GUYS MADE I WOULD DEF BUY THEM ALL PLEASEE! I ALREADY BOUGHT ALL THE OTHERS! So much better than the other versions! More of the store, mini games in between each day, and more to unlock. If you can, BUY THIS. I just bought game, because I've played this game in the past on a laptop. But once I bought it, it wouldn't download. So I deleted a ton of photos and like 5 apps, assuming I was out of storage. But once I did all that it still didn't work.